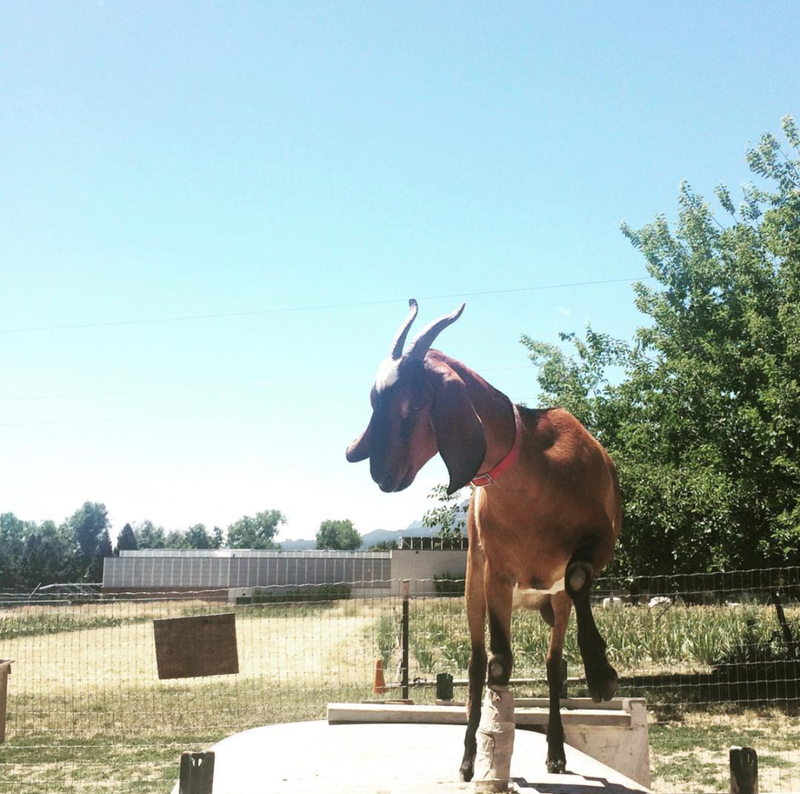 Nestled in North Boulder, Mountain Flower Dairy is home to more than thirty goats. The dairy shares a 25-acre parcel of land with Growing Gardens and Long's Gardens. It's a beautiful example of the power of integrative urban agriculture to both strengthen soils (goat manure can help to fertilize plants) and support local farms (if not for the historic Long's Gardens land, this site for urban ag couldn't have taken root). On a blue Colorado morning, I spoke to Taber Ward, Mountain Flower's Co-Founder and Executive Director, in MFD's sweet little office space. As she pasteurizes chèvre for that afternoon's summer camp class, our conversation meanders from the real cost of food to the beauty of hands-on work. "Animal husbandry means being embodied," Taber says. "[It's about] taking care of the things I love." Taber grew up in upstate New York before migrating north to McGill for college to study anthropology and food systems (a girl after my own heart!) In Montreal, Taber worked on a rooftop farm as well as was part of a fresh-from-the-farm delivery service that brought nourishing fruits and veggies to communities throughout the city. A summer spent working on a goat dairy affirmed Taber's passion for animal husbandry. In 2012, Taber and Co-Founder Jonathan Vaught reached out to the Long Family to set up a working dairy. In the years since, Mountain Flower has established a raw goat milk CSA (170 families get milk from just 14 goats), a kid's summer camp, and interactive workshops. The site has grown into a hub for community that links urban dwellers to the loamy soil underfoot. During summer Saturday visiting hours, families gather by the tall grasses to feed a goat; Wonder Press, downtown Boulder's destination for wholesome juices and ghee-rich coffees, donates some of its leftover pulp to serve as a sweet snack for the herd. In this way, MFD's situation at the nexus of rural and urban enables the farm to knit together the diverse threads of community that course through Boulder. Those goats are doing good. In collaboration with the Dairy's Board of Directors, Farm Director Michael Montgomery and Education and Outreach Coordinator Madelynn Evensen, the team is working to revitalize the idea of what farming can be. "[Mountain Flower] is much more about animal rights and public health," Taber notes. MFD is on a mission to challenge the fetishization of our food and land. The farm's hope is to create a working model that will attract younger farmers by providing flexible hours (Taber works full-time as a lawyer as well) and shared responsibilities. Although this means higher labor costs, it also translates into a farm that fits into future visions of what kind of permutations living sustainably can take. Wandering through Mountain Flower's pastures later that day, I realize that this farm embodies the kinds of principles that I could bring back into my own life. The romanticization of farm life has been erased at MFD; you get the sense that the team works damn hard to nurture this space into being. In place of this fetishization, however, grows something far more nuanced: a holistic slice of urban agriculture life that is dedicated to exploring embodiment. How to be, how to live, how to tend to this world and everyone we love within it in ways that heal our landscape and not harm it.